Thank you, Andrew 🙂 You are most kind. Will be over to your blog this week. Have had rather a lot on my plate for weeks now, so being generally neglectful of all my online friends. Please forgive me. Actually, I posted a romantic poem about love and flowers. Curious what you think of it. No problem. Read it whenever you can. At long last I’ve read your poem 🙂 Sorry about the delay. Have commented over at yours. Thanks. I know how you like to write about nature. I tried growing them once. Failed miserably! 🙂 I would much rather read your lovely tanka about them. Wishing you a brilliant Tuesday, my talented friend! They love the chalky dry soil in my garden. No special treatment at all. Wishing you a brilliant Tuesday, too. Sorry, for being so neglectful of late. Have been taking a long rest from blogging and writing, and getting some fresh air. Was feeling a bit jaded, but am starting to feel better now. Nearly there! #Haiku Happenings #7: Sarah Potter’s latest #tanka! I related to the girl in the crazy hat brandishing a paint brush. 😉 So much to say in few words. Lovely. Hah! I bet you did relate to that, too 😉 I’m glad you liked it. I had an email the other day, re my writing, that was encouraging because it didn’t say the words “unfortunately” or “not for us”, but I will stay grounded (wearing my hat, of course), as it’s early days yet. I’m seriously in need of a big “yes” someday soon. 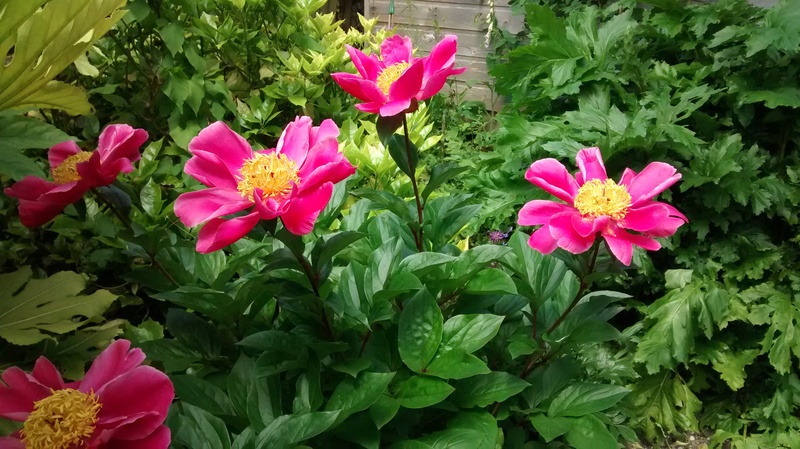 Such a pretty photo, Sarah, but I had thought peonies had many more layers of leaves? I purchased some recently, and they were big and full. Is that a much different kind of peony than is pictured here? My peonies do have many layers of leaves lower down. It’s just that that there’s a section of stem of about six inches that’s unleafed just beneath the flower. I think there are quite a few varieties of peonies, some with multiple petals that make them have a more ball-like shape. Also, there are quite a few different coloured varieties. I’ve seen deep-red ones as well, but am not sure that they would grow on my chalky soil. Thanks Sarah! I tend to love flowers that have a lot of petals, like ranunculus flowers, roses, and peonies. What wonderful delights flowers are to us. 🙂 Happy gardening and writing!